Surely the Devil had come to Salem in 1692. Young girls screaming and barking like a dog? Strange dances in the woods? 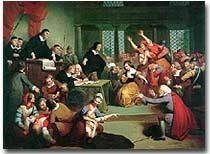 What conditions enabled the Salem witchcraft trials to occur?